The Dodgers salvaged one game from the three game series with the Marlins and now we start a four game series with St. Louis. Sunday, Jason Schmidt did not fair well. an error by Furcal did not help and Weaver did not have it. I was so rooting for Schmidt to do better. I believe that Joe Torre will give Schmidt one more start and if he does not do well, that will be it for Schmidt. Sunday when I got to my seat, there was a nice couple holding a baby and being interviewed by a local TV station next to my seats. I told them to stay there as I jumped over and gave them room for their interview. I was curious when I saw their baby girl with a pink bib and pink hat reading “30 ballparks and a baby.” Baby Sophia is so adorable!! as you can see in the picture below. I missed getting Judy. 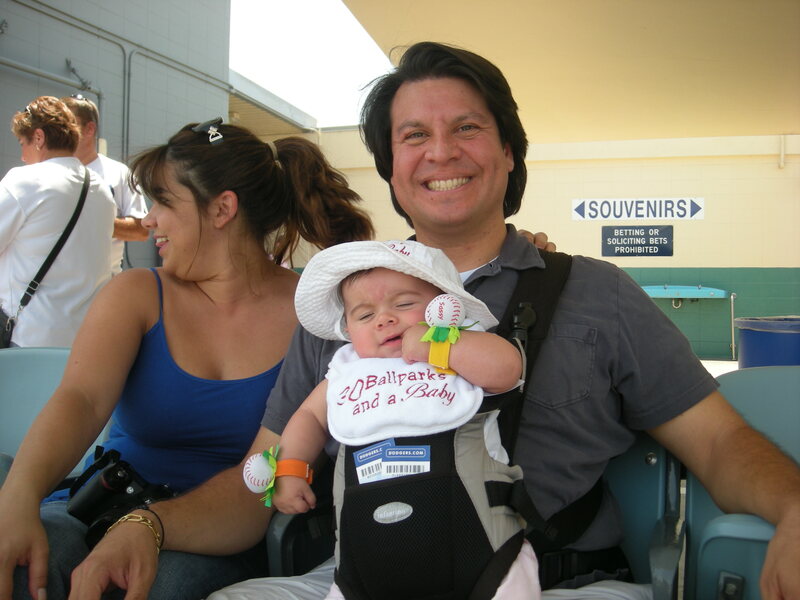 Isn’t baby Sofia adorable? Look at baby Sofia’s bracelets. You can check their website at www.30ballparksandababy.com. Buena suerte Judy, Roberto and Sofia! It was a big pleasure meeting the three of you. God bless you and keep the three of you safe! My Dodgers are at St Louis for a four game series. 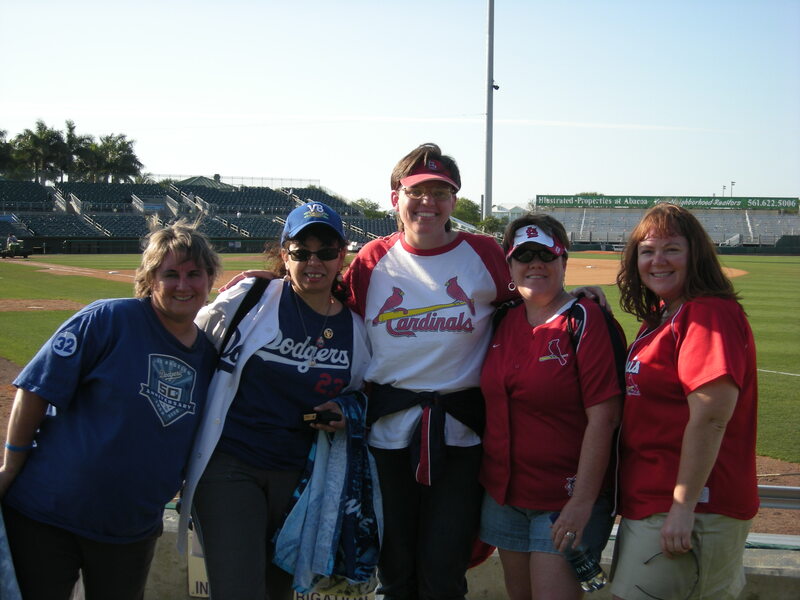 I was in St Louis a few years back when the Dodgers lost all four games BUT this is a much improved team so Go Dodgers! I am going to check if any of my good friends that are big Cardinal fans in this picture are going to any of the games. I know Linda and I wish we were back in St Louis this week so that we can improve on that 0-4 record. I just found out my friend Amy from ITD will be going to tomorrow’s game. Let’s go Dodgers, Let’s go!! The Cubs could use some Dodger help. You guys kicked them out of the playoffs last year, how about helping them get back in this year? All you have to do it sweep the Cards. Piece of cake! You can do it! I checked out that website. Very cute. I wish we would have but today’s game was so f r u s t r a t i n g!! I know I wrote a thread about Wolf not getting any run support and it is still the same way. The guy pitched great, goes out losing 1-2. I tell you, Fox gets no respect. Nice job, and good the Dodgers weren’t swept by the Marlins. Now it’s time to take on the Cardinals. Dodgers are on a roll nowadays. Hopefully since the Cardinals are struggling, you’ll keep them that way going there. Cardinal people are AWESOME people. Glad you have some for friends… and I’m glad we started out the right way by winning game one of the series. Thanks! And regarding the Dodgers, you have good taste :-). I have to go back to your blog and see why 55. I like that number as that is the year the Brooklyn Dodgers won the W.S. I have to agree with that! the Cardinal people I have met are awwwsome! agh, don’t remind me of yesterday’s game. We need all the luck we can muster. Maybe like Cerrano in the movie Major League , we can sacrifice a live chicken. Just kidding! Well we started the series against the Cardinals very bad. Dodgers need to focus. 2nd half of the season is tougher and we need our Boys to keep up the great job. GOOOOOO DODGERS! yeah …we started bad even though El Lobo pitched well. Tough luck for El Lobo. He and the Dodgers need to shake off the loss and like you said focus. Concentrense Doyers! and r e l a x . . . . r e l a x…. GOOOOO DOYERS! Yo know Rosie, I need to get me one those t-shirts that say “Doyers” I hear they have them in the Alley. I have not been there in years! 30 Ballparks and a Baby… sounds awesome! Interesting how your closer has the third most wins on the team! “30 Ballparks and a Baby” sounds like a great family comedy on the Disney Channel! Very cute. Good luck with the series against the Cardinals. Even though the Dodgers lost last night, it should be a good one between two good teams. When I click on your blog, i get message “internet explorer cannot display…” I see what is wrong, you have an “s” after http. You are back!! 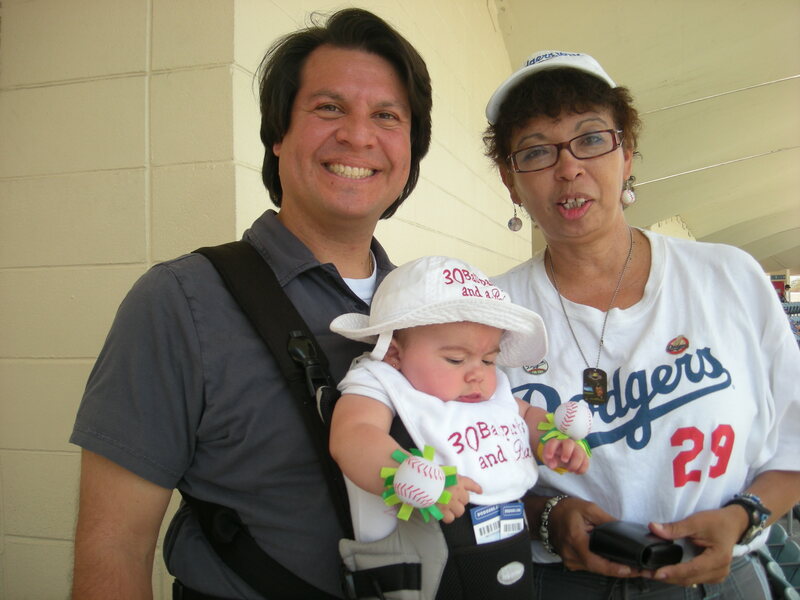 Baby Sofia from 30 ballpaks has already seen more ballparks than I have! Yes, is unbelievable that our closer has the 3rd most wins! 7-0. another of our guys in the bully is 4-0. Hopefully Billz gets number #11 tonight. He better go more than 6 innings. Our bully has been oversued. you always have such great ideas! I was just saying the t-shirt “Los Doyers” that I see fans wearing every once in a while but I like “ARRIVA LOS DOYERS!” You should submit your ideas or do a do it yourself . It could be your kiddy money to go see Los Doyers. i love the idea also of one of the rookies wearing trensas with a tipical Mexican dress for the rookie hazing. That would be a great shirt to wear…ARRIVAS LOS DOYERS! What a lucky baby! I’d love to visit 30 ball parks in 30 days!! BTW, I love the short name, I forget who at ITD started calling you that. i want a shirt like that! yes, lucky baby. She is such a happy baby. by the time she is old enough to travel on her own, there might be more parks that have been replaced by others so could add more parks. Hopefully Fenway and Dodger Stadium are still around as beautiful as they are now. My name varies…MsRussy, Rose, Rosie, MsRussyEthier, Dodgersrule1655 (my original bloggers name). But yeah I like Ms.Russy…it kinda sounds like someone mispronounce my name Ms. Rosie….LOL. But I like claiming both my Martinista status and my Ethieraholism status….LOL! I will respond to ethier one. Hey but you know what??? GREAT IDEA…bedazzled a shirt with Ms. Russy and one with Ms. Ethier….LOVE IT. I just need a bedazzler! My birth name is ROSIE…and it is not short for anything. It is just ROSIE. I use ROSE, cause I love roses, and pink is my favorite color (but I THINK BLUE!). Your Martinista status got you that baseball! You could bedazzle a shirt with Ms. Ethier on one side and Ms. Russy on the other side. Thanks for the commenting. In regards to your question about Dusty, I don’t really have too high of an opinion on him, mostly due to how he seems to pick “favorites” and with a young team, that doesn’t play out too well in terms of getting guys playing time. ==But that couple with the baby was at on of the games (in Cincinnati) I was at earlier this summer (saw them on the Jumbotron, and they were featured on the news). Before then, I hadn’t heard of their trip across the country, visiting all the ballparks and everything. It sounds like a pretty cool trip. Sometimes a good player does not make a good manager. He seems like he over abuses pitchers. So you saw the 30 ballparks and a baby family! Yeah, I saw that they have the writeup in their website. Their next park is San Diego. Because he is your fav, I am glad you ended up with his baseball. I bet you voted foor him a lot when he made the All-Star in San Francisco. I was at the bar next to the ballpark (could not get tickets) and boy those Giant fans refused to root for him . Because Grady Litte’s wife saw me carrying a box full of votes for Russell and she knew I had taken another box the week before, she gave me a Dodger handbag made by her daughter in law. She included a nice note thanking me . She was really nice. Tough loss today. very frustrating. Well, I’ll check that website you included. Long time no talk to you girl! Did you read that I said based on who I have met, St Louis people are awwwsome! I was afraid of this series but today was a nightmare for us. What is your record when you go? You know I love you too but I hope Mr. Sunshine(Kershy) has a gooood game. Good luck to the Cardinals AFTER we leave. Wish I was there! but I think my next trip is to AZ. I did see what you said about STL people. You know we love you too! I haven’t kept track of my record but it is pretty good. I can only remember a couple of losses when we go. We have seen a lot more wins. Hope that continues. You guys have been awesome this year. I will just be happy with a split but I really like it when they win when I go to the games. Your boys will be fine. I can’t see anyone catching you. We took back first place tonight but only by 1/2 a game. Our division is making me crazy. Emma: This is a nice blog. I’m a Yankee fan, but I like the Dodgers because of Joe Torre. They have a great team, the best in the majors! I like that Andre Ethier guy, he’s really cute 🙂 If our teams meet in the World Series, that would be interesting. I would be sad if the Yankees lost, but honored to lose to Torre. We have a lot in common. We are both CRAZY for our teams! I’m glad that I’m not the only one who takes notes 🙂 Baby Sofia is too cute! I wish your team luck. Adios amiga! -from Virginia. Oh they may be Bums, but they’re my Bums…Go Dodgers! !